Her Majesty The Queen and His Royal Highness The Duke of Edinburgh attended an organ recital in St George’s Chapel on Wednesday afternoon. The event celebrated the 150th anniversary of the Royal College of Organists. A recital was given by Thomas Trotter with music at the beginning and end of the event played by Assistant Director of Music Richard Pinel and former Organ Scholar Ben Bloor. 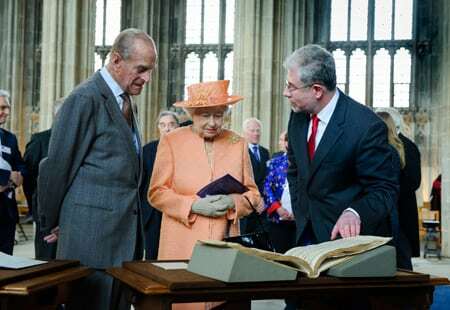 After the recital The Queen and The Duke of Edinburgh were shown some treasures from the RCO’s archives and then met some of the representatives of the College. A new screen was in place for the invited audience to watch the recital; it is larger and more robust than its predecessor and the plan is for it to be used at all forthcoming organ recitals and some other events. It was purchased thanks to the generosity of the Friends of St George’s. Flourish for an Occasion by Sir William Harris (Organist of St George’s 1933 to 1961 and President of the Royal College of Organists 1946-1948); Toccata, Adagio and Fugue in C Major BWV564 by Johann Sebastian Bach; Suite Laudate Dominum by Peter Hurford (President of the Royal College of Organists 1980-1982); Toccata (Symphony No 5) by Charles-Marie Widor. Lunchtime organ recitals will take place on Tuesdays at 1.10pm on the following dates. Please be at King Henry VIII gate no later than 1pm. The audience will be able to see the organist on the screen. 29 April, 6 May, 13 May, 20 May, 3 June, 10 June, 17 June and 24 June.